Jeff Gordon, driver of the No. 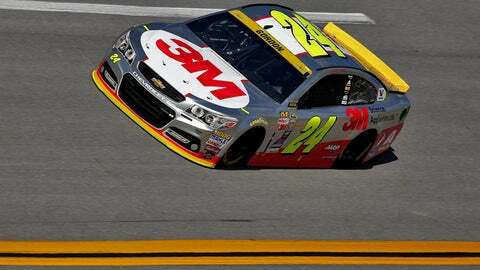 24 Hendrick Motorsports Chevrolet, was fastest in qualifying Saturday at Talladega Superspeedway. Jeff Gordon will have a great view to start his final race at Talladega Superspeedway on Sunday. 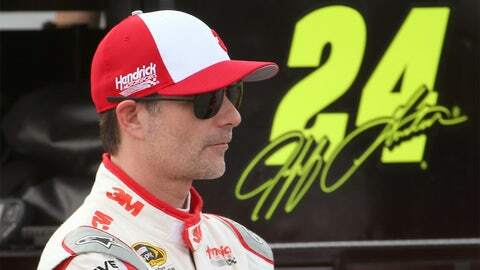 The Hendrick Motorsports driver earned his fourth pole of the season and fifth at Talladega with a lap at 49.234 seconds at 194.500 miles per hour during Saturday qualifying at the 2.66-mile track. Hendrick Motorsports drivers swept the first three spots in the field and put all four cars in the top five. Non-Chasers Kasey Kahne and Jimmie Johnson were second and third, respectively. Matt Kenseth put his No. 20 Joe Gibbs Racing Toyota fourth, followed by Dale Earnhardt Jr. in fifth. Trevor Bayne, Kevin Harvick, Denny Hamlin, Ryan Blaney and Joey Logano rounded out the top 10. Brad Keselowski will start 11th, followed by Kurt Busch in 14th, Carl Edwards in 15th, Kyle Busch in 16th and Ryan Newman in 18th. Jeb Burton and Michael Annett failed to qualify. Saturday’s qualifying session was not without issues, however. Chase driver Martin Truex Jr. had his time disallowed by NASCAR after going below the yellow line in the tri-oval. When NASCAR went to single-car qualifying at Daytona and Talladega, drivers were told not to go below the yellow line during their lap. Truex said he was unaware of the rule and is not too concerned with starting at the back of the field. “Well the last couple of times we have been here we have run on the apron through the tri-oval,” said Truex. “Apparently there was a memo sent out and I never got it. I don’t really know what to say. "It won’t change (the strategy) at all," he said. "We started from the back last time too." In one of the more odd events in recent memory, Clint Bowyer’s car went in reverse as he was leaving pit road. The car backed into the nose of Justin Allgaier’s No. 51 Chevrolet, damaging the nose. The HScott Motorsports team went to work trying to fix the nose of Allgaier’s car, but Allgaier could only muster the 39th fastest lap. Bowyer said he thought the car was in first gear and was surprised when it rolled backward. He apologized to Allgaier and the No. 51 team for the incident. Bowyer will join HScott Motorsports in 2016 before moving on to replace Tony Stewart at Stewart-Haas Racing in 2017. "This was supposed to be an uneventful say," said Bowyer. "I just made it eventful." While NASCAR impounds the cars after qualifying, the sanctioning body is allowing the No. 51 team to make repairs to the nose of the car. As a result, Allgaier will be forced to drop to the rear of the field to start the race.